As November turns to December, I’m pleased to have a full line-up of events ahead to wrap up the year right—beginning with two events this week. 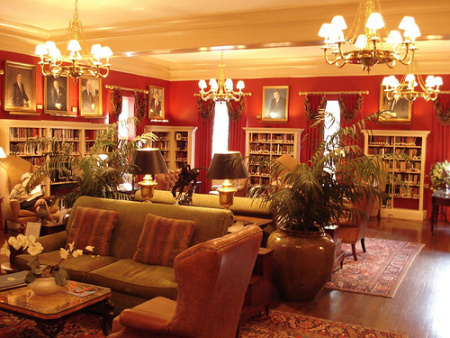 The 26th annual Meet the Author Night and Book Fair at the University Club of Washington, DC takes place on Wednesday, December 2 from 5:30 til 8 p.m. (The club’s library is pictured in the image above; the address is 1135 16th Street NW, in Washington, DC.) More than 60 authors will take part in the event—the only time each year that the club is open to the public—and Upshur Street Books will be on hand for book sales. Then on Saturday, December 5, the Chesapeake Chapter of Sisters in Crime will host its second author showcase of the season—this time at the Reston Regional Public Library, 11925 Bowman Town Drive, in Reston, VA. The event begins at 1 p.m. and features 20 chapter authors, including Donna Andrews, E.A. Aymar, Maya Corrigan, Ellen Crosby, Maddi Davidson, Barb Goffman, Sherry Harris, Maureen Klovers, Claudia Lefeve, Clyde Linsley, Millie Mack, G.M. Malliet, Sujata Massey, Eileen McIntire, Susan O’Brien, Alan Orloff, Kathryn O’Sullivan, Josh Pachter, Colleen Shogan, and me. Mystery Loves Company will host book sales at this event. Two other December events are still ahead—and hope to see lots of friendly faces at each! Saturday, December 12—Mystery Writers Event with Ellery Adams, Mollie Cox Bryan, Mary Burton, Maggie King, and LynDee Walker, Barnes & Noble, Chesterfield Town Center, 11500 Midlothian Turnpike, Richmond, VA • 2 p.m.
Sunday, December 13—Reading: On the Road with Del & Louise, appearing with John Grady, author of Matthew Fontaine Maury, Father of Oceanography: A Biography, 1806-1873, The Writer’s Center, 4508 Walsh Street, Bethesda, MD • 2 p.m. Happy holidays ahead to all!